The Moto Hint Bluetooth headset is comfortable, inconspicuous and nicely designed -- but whether it's worth the price depends on what you're looking for. When Motorola introduced last year's Moto X last September, it also announced a new Bluetooth headset called the Moto Hint. "Hint," presumably, because this is a headset that is so inconspicuous that if you have any hair covering your ears, nobody is going to see it. The original Hint was reviewed by Computerworld's JR Raphael back in October 2014. He liked the form factor and admired the way it expanded the "always listening" mode for the second-generation Moto X so that you could wake the earpiece with your phone's launch phrase. However, he also cited problems with the battery life and the rather high price. Motorola has now tweaked the Hint to try to deal with some of those problems. The question is: Are the tweaks enough? The Moto Hint is a very small (0.97 x 0.70 x 0.74 in.) and lightweight (0.21 oz.) headset that sits squarely within the ear like an old-fashioned hearing aid. Because it's so small, there is only one control; the outer surface of the Hint can be pressed to start or ignore a call or to start a voice command. There isn't even an on/off button -- the Hint is engineered to turn on automatically when you put it in your ear, and off when you remove it (via an infrared sensor). Unfortunately, the small size means a small battery -- 46 mAh to be exact. Fully charged, the Moto Hint offers 3.3 hours of talk time -- an amount that will hardly get you through a day's commute. To make up for this, Motorola includes a 2.51-x-0.70-x-0.74-in. wireless charging case that has a drawer for the headset: You pull the drawer out, fit the Hint snugly inside, and close the drawer. As it sits in its case, the Hint recharges. The first iteration of the case brought the amount of talk time to a total of 10 hours. In the new version, the case has been upgraded so that users have a total of up to 17 hours. This is certainly an improvement on 10 hours, but it still means keeping the Hint in its case whenever you're not using it -- something that may not be convenient if you're on a long drive. 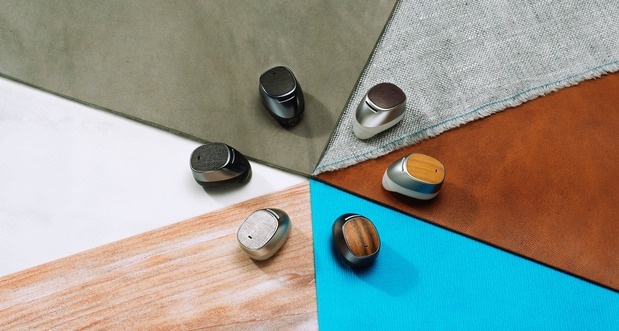 The Moto Hint will be available in a variety of materials. The Hint has always come in different styles; this latest version has been manufactured "in a variety of natural materials and hues," including light and dark canvas, bamboo, walnut, and brown or black leather. The version I tried out was the "Dark Fabric" design -- a slightly rough black fabric on the outer surface of the earpiece and the case. As of this writing, it seemed to be the only design currently available; the others should follow. Motorola also says that it added new gel ear tips that offer a better seal "locking in the sound." I didn't try the first model of the Hint, so I can't compare the two. But I do have to say that I found this version of the Hint to be one of the most comfortable headsets I've tried so far. Most consumer headsets tend to occasionally work loose when I'm walking around with them; this one lasted for 10 blocks without my having to adjust it once. And the sound I got from listening to a podcast on a busy street was clear and audible without my having to hit top volume. Speaking of top volume -- improved volume and "more bass for music listeners" are other improvements listed by Motorola. I can attest to the volume; as just mentioned, I found it quite satisfactory. It's possible the bass has been improved as well -- the sound I got when listening to music was reasonable. However, since you're listening with only one ear, no headset is going to be ideal for any type of music enjoyment. For that, you need a pair of earphones or earbuds. Finally, the listed price has been dropped from $149 to $129. This puts the Hint a bit closer to the realm of reasonably priced, although it is still more than the $100 Jawbone Era, which also comes with a charging case; or the Plantronics Explorer 500, which lists for $60 and includes a looped charging cable. The Moto Hint is a well-performing, easy-to-use Bluetooth headset which is ideal for Moto X users who want to use their hands as little as possible (and works well with other smartphones as well). The latest version is comfortable to wear, has improved sound and several snazzy-looking styles. Are these factors are a good tradeoff for a price that is still on the high side and a battery that will have to be recharged often? That will depend on what you want from a consumer headset.